1 of 1 Soak 1/2 cup chopped sun-dried tomatoes in 1 cup boiling water for 3 minutes. Drain, reserving 1/3 cup of the soaking liquid. 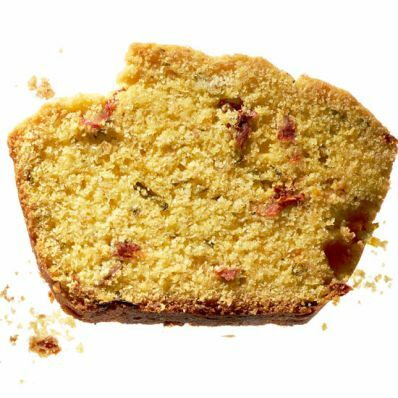 Add 1/3 cup grated Parmesan, 1/4 cup cornmeal, 2 tbsp flaxseed meal, 1 1/2 tbsp sugar, 1 1/2 tsp baking powder, 1/2 tsp crushed fennel seeds and 1/4 tsp salt to dry ingredients. Whisk 1/4 cup oil, 1/4 cup sour cream, 1 large egg and the 1/3 cup soaking liquid into wet ingredients. Fold softened tomatoes and 1/3 cup chopped basil into mixed batter. Transfer to prepared pan and bake at 350 degrees for 50 minutes.